Oneworld is not only available for event charters and weddings. Oneworld is the perfect solution for an exclusive luxury yachting holiday. With two very diverse and different locations available during the year Oneworld is a year round choice for that perfect escape. Sydney in the summer (Nov – July) is a buzz with like minded people all taking full advantage of the beautiful weather and warmer waters. Exclusive restaurants and trending bars and cafes litter the cities shoreline making Oneworld the perfect six star accommodation with easy access to the hottest nightlife during the season. With the ability to anchor directly out front of the Sydney Opera House and the Harbour Bridge, Oneworld and her decks transform into your own personal exclusive floating hotel with the best view in the city. The five onboard guest suites each with their own private bathrooms means the whole family can come along and also take full advantage of the coolest water sports available on the harbour including multi-level Funair slide, jetski, kayaks, stand up paddleboards and floating mat. One day you are dining and dancing the night away in the heart of the city and the next you can be miles away up the Hawkesbury River surrounded by bush and the soft sound of the birds. A week can fly by in an instant. During the winter months Oneworld cruises north along with the humpback whales in search of warmer waters. Here we find ourselves in the magical Whitsundays (August – October). With the largest of 74 islands right at our door step Oneworld will leave no stone unturned. The vibrant underwater world in the many bays surrounding the islands is waiting to be explored. Swim with the turtles, dive with the Maori Wrasse or simply walk amongst the lemon sharks. Anchoring off the crystal clear waters of Whitehaven Beach is nothing short of a dream. Swim mere metres to the 99% pure silica sand and walk the 7km stretch that makes this beach world famous. Hike to the islands many peaks in search of that perfect profile picture or take the time to relax and reflect on how lucky we are to be surrounded by such beauty. With over 21 different anchorages available around the Whitsunday Islands you might just need two weeks to explore them all. While the captain takes you on a nautical adventure let the chef take you on one of a different kind, a culinary one. Meals and menus are changed daily to suit the seasons and your appetites and remember calories consumed on holidays don’t count. Oneworld and her professional crew of six are here to make sure you have the holiday of a lifetime. Let us take care of all the finer details, restaurant suggestions, bookings and excursions and just sit back relax and enjoy your time on board Oneworld. 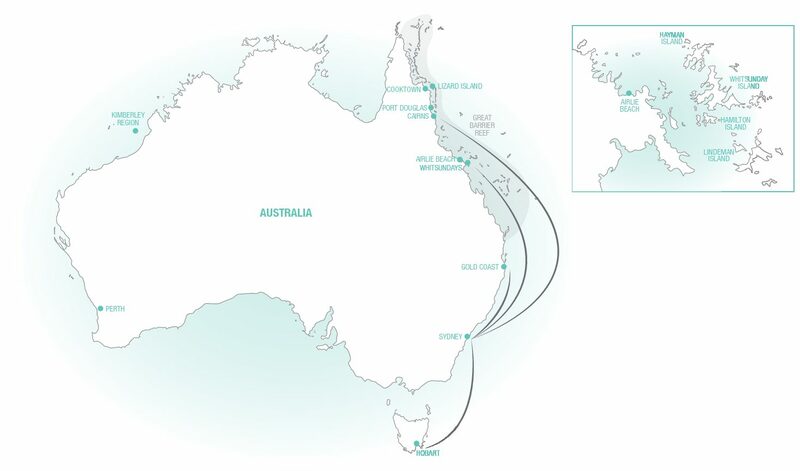 All itineraries in Sydney and the Whitsundays are an indication only and are subject to weather conditions. If you have a place you really want to visit or have an idea of what you absolutely must get out of your yachting holiday just give us a call and we can tailor an itinerary especially for you.